The Fairchild A-10 Thunderbolt II (aka Warthog) offers a wide variety of features and controls. Special features include the ability to simulate ordnance use, and a detailed 3D textured cockpit. 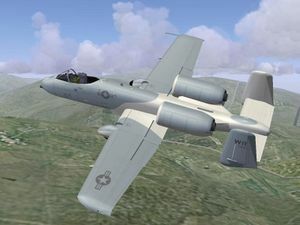 Many of the A-10's flight systems are modeled as well, such as support for TACAN. The Fairchild Republic A-10, also named Warthog, is a U.S. single-seat, twin-engine, very robust jet aircraft designed for ground attack. 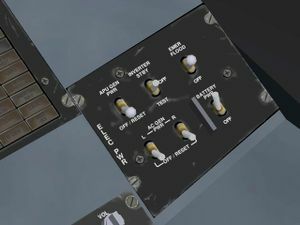 In the current version, the aircraft simulation begins with the aircraft powered down. The electrical power systems and the APU's operation are simulated to a large extent. Mid-air refueling is also implemented. The navigation instruments are TACAN, ILS and also a VHF so you can have homing on a VOR station. Several external loads are available and the HUD provides a CCIP. At FlightGear startup, both electrical power and APU are shut down and there is no external power supplied. 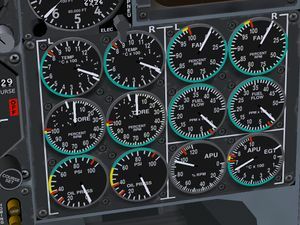 You, might see, early on, some needles spinning back on the engines gauges panel and the VSI ... this is only a software initialization artifact. So, look at the right console, there is a panel with 6 switches, that's the Main Electrical Control Panel. Hit Ctrl-c and you will have a view of where to click. Let's connect the battery: switch on the battery switch. A few indicators should light up, but not all of them. Now with the battery connected you can start the APU. 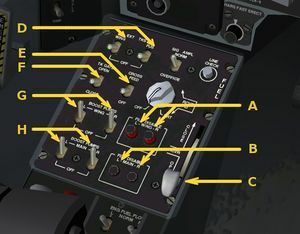 The APU start/stop switch is located near the throttle on the left console. Switch it on. Now check the APU's tachometer and EGT on the engine gauge panel. If the APU has started successfuly you should see the EGT (Exhaust Gas Temperature) rapidly climb to 800/900 °C and then stabilize when the RPMs reach 60%. Now the APU has sufficient RPMs to provide electrical power through its generator. So let's turn on the APU generator. This one is on the main electrical control panel, upper left corner of the electrical control panel, right console again. With the APU generator powered up most of the instruments receive electrical power and now the AOA]] indexer lights up and the HSI (the compass) and ADI (artificial horizon) look much better. At 85% RPM the APU supplies enough bleed air to start the engines. APU running, Engines gauges at stop. Now that we have minimum electrical power and bleed air supplied by the APU, starting the engines is straight forward. Just click on one of the throttle rails (Ctrl-c to see them), the throttle will move from stop to idle and the engine start. Wait for the starting cycle light to turn off, turn on the corresponding generator and repeat with the second engine. FlightGear A-10 starts with all internal tanks full. 2 wing tanks (left and right), 2 fuselage tanks: left main (aft) linked to left system and right main (forward) linked to right system, up to 3 external tanks (2 wings and 1 fuselage). Normally the left wing and left main tanks feed the left engine and the APU. The right wing and right main tanks feed the right engine. The two feed lines can be interconnected by opening the cross feed valve (E switch). 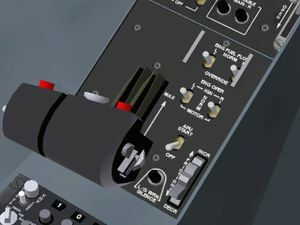 The wing boost pumps (G switch) supply the respective engines until the wing tanks are empty, then the wing boost pumps automatically shut off. The main boost pumps then supply the respective engines with the remainder fuel in main tanks. In case of a wing tank boost pump failure, the wing tank fuel will gravity feed its respective main tank if the main tank fuel level is below 600 lbs. Check valves prevent reverse fuel flow from the main tanks to the wing tanks. In case of a main tank boost pump failure, the affected engine will suction-feed from the affected tank for all power setting up to an altitude of nearly 10,000 feet. Unequal fuel level between left (aft) main and right (forward) main tank (imbalance superior 750 lbs) will cause a longitudinal CG shift that may exceed allowable limits. In this case, opening the valve "tank gate" create a link between the two main tanks. Fuel from the external tanks is transfered to the wing or main tanks by pressure from the bleed air system. Wing tanks can be topped when the fuel level is below 1590 lbs. Main tanks can be topped when the fuel level is below 3034 lbs. The cycling is repeated until fuel is depleted from the external wing tanks first, and external fuselage tank secondly. For negative G flight, collector tanks will supply the engine with sufficient fuel for 10 seconds operation at MAX power. With fully loaded fuel tanks and a full load of armament, the A-10 is heavy--about 50,000 pounds. At this weight the plane is quite difficult to fly. Symptoms you would notice are difficult to take off, difficulty gaining altitude, difficult to manoeuvre without triggering stall warnings or actual stalls. To avoid these problems, if you choose to equip the plane with full armament you may wish to fill the tanks only half full or so--the plane becomes much easier to fly and half fuel is still enough for a reasonably long flight. The Fuel Control panel is located on the forward part of left console. 1 lever, 4 push buttons and 8 switches are functional. (A) Fill Disable buttons, left and right wings tanks. Here fill disabled (button up showing red stripe). Refuel disabled for the wings tanks. 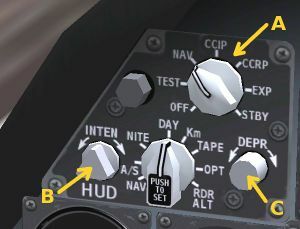 (B) Fill Disable buttons, left and right main tanks (practically forward and aft fuselage tanks). Here fill enabled (button down hiding red stripe). Refuel enabled for the main tanks. (C) Refuel Receiver Door lever. (E) Cross Feed switch, allow any operating boost pump to feed both engines. (F) Tank Gate switch, open a valve linking the left (aft) and right (forward) main fuel tanks. The Head Up Display is turned off by default at aircraft startup. To turn it on electrical power on at least one of the three generator is needed as it isn't wired to the battery. The HUD Control panel is located on the upper left corner of the main instrument panel. Three knobs are functional. (A) Mode Selector Switch: OFF, TEST (standard display), NAV (standard display), CCIP (standard display + Countinuous Computed Impact Point), CCRP (standard display), EXP (standard display), STBY (standard display). Actually you will mostly use NAV and CCIP as other modes are not modeled yet. See later in Weapons System about reticles use. (B) INTEN knob: Adjust the HUD luminosity. (C) DEPR knob: Changes the vertical position of the primary aiming reticle in the HUD, There is a digital index in the HUD showing its position, range from -1.00 to 1.00 followed by the letter "D". (E) Indicated Air Speed, Kts. (H) Primary Aiming Reticle Digital index. (J) Indicated Altitude in feet (ASL). (K) Radar Altitude in feet (AGL) followed by letter "R". (I) Aircraft Pitch in degrees, boxed. (M) Total Velocity Vector indicator. (N) Pointer showing the rudders deflection. Be sure to have energy before trying to use the armament panel. The gun's rounds counter (A) should be lighted in blue and the HUD should be active. There is actually 2 AIM-9, the GAU9 gatling gun, and MK85 250 pound bombs. First of all push up the Master Switch to ARM (B). For the gun, push up the Gun Rate Switch to HI (right of the rounds counter). 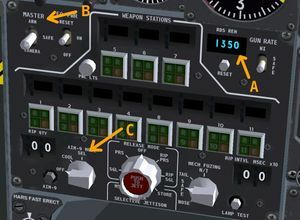 You should have on the left side of the main panel a red light indicating 'Gun Ready'. Press key 'e' on the keyboard to fire the gun. For AIM-9, turn (C) the AIM-9 Mode Knob to SEL (click on the right side of the knob). Now a big circle appears on the HUD symbology, that the searching aera of the AIM-9. Now select Pylon #11, you should ear the seeker sound. This sound is audible only when an AIM-9 is available, selected and searching. Press key ',' to fire the AIM-9. 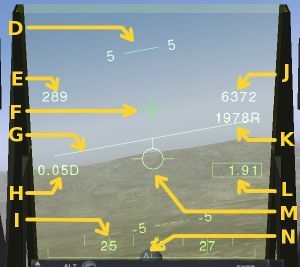 (In Flightgear, the key ',' is usaly used for left brake, in the A-10 a nasal script intercepts the binding for weapons release, this is not a definitive solution). You can also choose to fly without the AIM-9s and the ECM pod, press Tab or Ctrl-I on the keyboard to display the config menu. Several ground bombing scenarios suitable for the A-10, involving moving and static tank formations, explodable M1 Abrams tanks, etc. This page was last modified on 15 August 2016, at 16:56.